Crispy grains of toasted rice cereal and milk chocolate chunks with a caramely chocolate flavour coating. 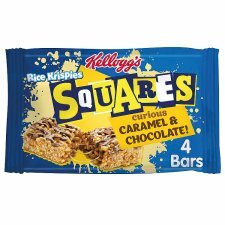 Sweet and sticky, Rice Krispies Squares are a snack time classic, and our chocolate caramel flavour is no exception. Rice Krispies are combined with chunks of chocolate and gooey caramel to create a tantalising snack that tastes as good as it looks. Whether you're treating the kids or enjoying yourself, this is a great treat for snack time.